Yesterday evening, I was watching another compelling BBC production, broadcast on Danish television: Earthflight, North America. In quite a unique way, the viewers got the rare opportunity to see through the eyes of birds such as eagles, geese, and pelicans and follow birds as they were migrating, escaping, hunting for prey, etc. It made me think of the 19th century masterpiece 'Birds of America' by John James Audubon, which can be viewed in the National History Museum in London. The book features 435 stunning hand-coloured plates that show birds life-size, in natural positions and in their natural habitat. One of the things that I find interesting - and quite unexplored - is Blastocystis in birds. By 'unexplored' I mean that relatively little sampling has been done, and so the number of observations of Blastocystis in birds is still limited compared to other types of hosts. However, there is a brand new paper out in 'Infection, Genetics and Evolution' which includes observations on Blastocystis in birds (of America!). You see, I was invited in on a study by colleagues in Colombia who had access to DNA from quite a few faecal samples from a number of host species, including feral birds, and what we found confirms the quite unambiguous trend seen so far: Birds - no matter where on this planet - appear to be colonised mainly by ST6 and ST7. As a matter of fact, in the present study only ST6 was seen in almost 50 Colombian passerine birds of varying species, most of which I believe are limited in geographical distribution to the Americas: Passer domesticus, Thraupis episcopus, Oryzoborus maximiliani, Sicalis flaveola, and Petrochelidon pyrrhonota. Moreover, only one allele of ST6, allele 122, was identified. Notably, the prevalence of Blastocystis in the sampled bird population was 90%. I believe that this is the first official report on Blastocystis in passeriformes. Other major groups of birds previously sampled include galliformes, anseriformes, and ratites (Stensvold et al., 2009; Alfellani et al., 2013). Other subtypes have been reported in birds (Alfellani et al., 2013), but due to the very low number of samplings these subtypes may be more or less co-incidental/abberant findings. Of note, some samples from birds have been untypable. I have a slight recollection of detecting ST3 in Icelandic rock ptarmigans (in mixed ST infection) collected by Dr Karl Skírnission, but that certainly needs confirmation. Bird contact/bird droppings - a significant source of Blastocystis in humans? 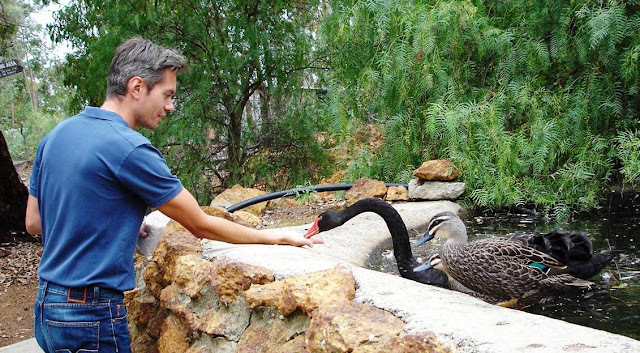 Me feeding some 'Birds of Australia'. Photo by Dr Rebecca J Traub. ST6 is very rarely seen in humans in Europe. In other parts of the world, for instance in Egypt and some Asian countries, ST6 appears relatively common, but we do not know much about 'bird subtypes' in those particular regions. Also, the situation in the US and Canada is more or less completely unknown (Blastocystis subtyping is something that appears not to attract research groups in North America apart from the one led by Dr Ron Fayer in Beltsville, Maryland). ST7 is occasionally seen in humans in countries such as Sweden and Denmark. But in my - still limited - experience, individuals infected by these subtypes are not necessarily prone to 'suffer more' from intestinal symptoms than those who do not have these subtypes. While human cases of ST6 (and ST7) may represent cases of zoonotic transmission, it is far to early to draw any conclusions on this. It would be important to compare ST6 and ST7 18S alleles from humans and birds. MLST typing systems for these two subtypes are not yet available, but 18S analysis in itself may prove valuable for molecular epidemiological analyses as in the case of other subtypes (Stensvold et al., 2012). 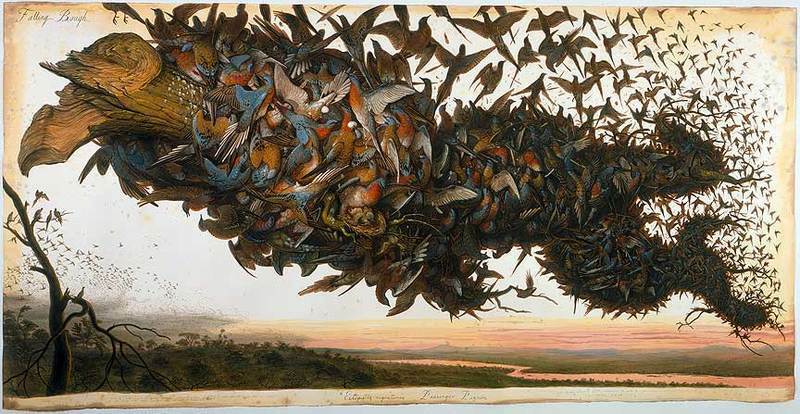 Walton Ford: "Falling Bough" (Source). You will also see the now extinct Passenger Pigeon in 'Birds of America'.